tpdnews: Man who falsely ID'd himself arrested. On October 28, 2013 we posted about a motor vehicle accident which resulted in the arrest of an individual for Operating a Motor Vehicle Under the Influence of Liquor and other charges (see posting here) . At the time of his arrest and during his booking procedure that individual provided a false name to officers and subsequently the wrong person was charged. 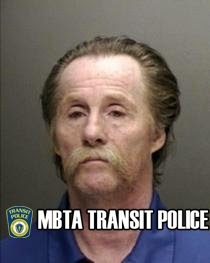 Upon discovery of this information the Transit Police Department took immediate action and secured an arrest warrant for the rightful subject, James Tilton. Earlier today James Tilton, 57 of Avon surrendered himself to Transit Police detectives at TPD HQ. Tilton was processed and brought over to South Boston District Court for arraignment.